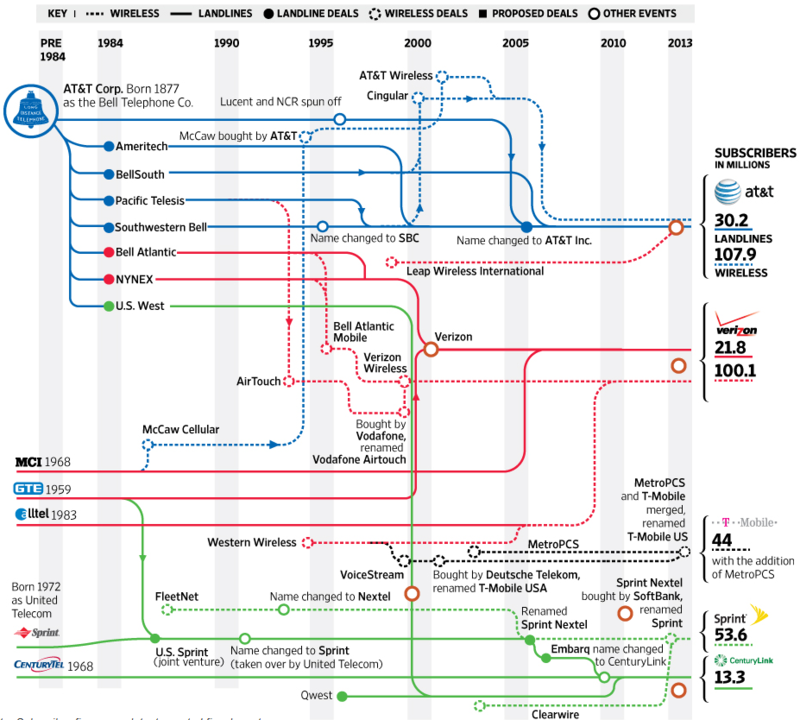 Here is a spaghetti chart created by the WSJ of the US telecom space. It lays out roughly how many current subscribers (many from other carriers) pass through US telecom giant, AT&T. The reason for this is that according to the latest revelations from the NYT, which following recent work-sharing with the Guardian is now another official distributor of the Edward Snowden leaks (who in a brilliant move has decided to spread out his disclosures week after week, many times allowing such staggered disclosures to catch the administration – which has no idea what is coming next – in flagrant lies), the chart shows that 140 million landline and wireless paying AT&T customers is the minimum number of affected Americans whose every call is recorded, however not directly or indirectly by the government, but rather by a private corporation working in collaboration with the US government. According to the NYT the name of the collaboration is: the Hemisphere Project, fomerly known as Hudson Hawk. “Minimum” because the number of affected American citizens is far greater than just AT&T customers. As the NYT reports, every call that crosses through an AT&T switch, not just calls made by AT&T customers which means virtually every US phone call, is recorded in a formerly top secret AT&T database that has existed since 1987 and whose “scale and longevity of data storage appears to be unmatched by other government programs, including the N.S.A.’s gathering of phone call logs under the Patriot Act.” It is a database which adds 4 billion call records every single day and which unlike the N.S.A.’s also includes information on the location of callers. In other words, before the NSA was recording every phone call, that task was being handled by another entity: AT&T. The cover back then, just like the Patriot Act is the cover for the continuation of the NSA’s espionage operation against America’s own people, so Hemisphere was in collaboration with counternarcotics agents and federal and local drug officials. And of course, just like with the NSA and its utmost secrecy, there is no way to monitor and observe what if any checks on the violation of privacy rights exists. One can simply hope that unlike in every other instance, that US government officials never had an inkling to abuse this treasure trove of phone records for non-drug related offenses. It’s unknown for now how useful the project has proven when heartbroken “drug-enforcement” officials, or anyone else with access to the AT&T database for that matter, seek to find dirt on their exes. Like NSA agents for example. What is known, at least on paper, is that unlike the FISA Court which decides what surveillance requests are granted (all of them), the inquirer in this case is the D.E.A., which submits a request to AT&T, which then scours through its trillions of records to find what the DEA is looking for. In other words, more of the same justification: in order to find the needle, the US needs to record every component of the haystack going back decades. Or a blanket, pervasive wiretap of anyone and everyone, with the only gating factor being the DEA’s decision to single out someone as a potential perpetrator, thus unlocking all of their personal phone records at a moments notice. The good news: There are some alleged success stories (but once again, not preventing the Boston bombing). The bad news, personal privacy no longer exists in any capacity, in which the public-private complex collaborates against its citizens without express prior public knowledge or permission, and in which “some” have access to all private information merely “for the greater good.” Naturally, any abuse of the greater good, is at the fault of the “isolated” perpetrator, not the enabling behemoth government which has George Orwell spinning in his grave. I am actually thankful to the owner of this website who has shared this impressive paragraph at at this place. I got this web site from my pal who told me on the topic of this website and at the moment this time I am visiting this web page and reading very informative articles at this place.